The current boundaries for Senate District 37. 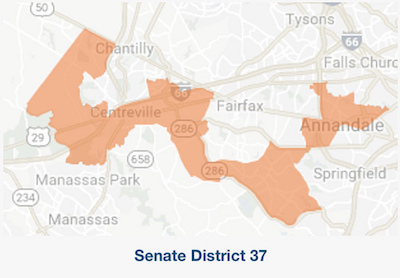 A constitutional amendment aiming to create an independent redistricting commission in Virginia has reached the Senate floor and may come up for a vote this week. Barker’s proposal faces a long road to be added to the Virginia Constitution. Constitutional amendments must pass in two legislative sessions and then be approved by voters in a statewide election.